It’s always a joy to join Alison and the after school allotment club in Cranborne. The children are so enthusiastic about cooking the produce they have grown. For the second year running we have been involved in the RHS Big Soup Share. 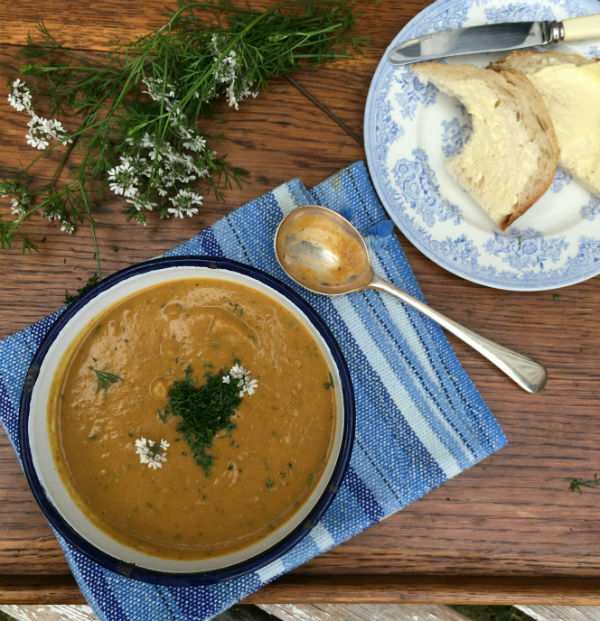 Chopped butternut squash and carrot were brushed in olive oil and roasted with garam marsala then we added onions, potatoes with a vegetable broth and then pureed with coriander and coconut milk to create a vegan, dairy and gluten free soup. A second saucepan of earthy beetroot with Bramley apple and yogurt soup was made by roasting the beets until they were soft along with finely sliced red onions. These were added to chopped potatoes, homemade chicken stock and simmered slowly. We finely chopped three more beetroots and cooked them in a little water until tender and set aside. The soup was pureed until smooth and we added three generous tablespoons of Greek style yogurt and then the chopped beets along with the cooking liquid were added and the soup was heated gently until hot. Meanwhile the children baked bread in the clay oven and collected walnuts from under the tree in glorious autumn sunshine. It was a perfect day.